I Augustine Washington no rainy. Ny vadiny dia Martha Washington. Ny zanany dia John Parke Custis, Martha Parke Custis. 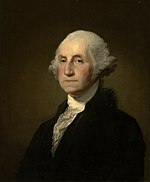 Ny rahalahiny sy/na ny rahavaviny dia Betty Washington Lewis, Samuel Washington, John Augustine Washington, Charles Washington, Augustine Washington, Jr., Lawrence Washington. Voaova farany tamin'ny 31 Janoary 2018 amin'ny 06:44 ity pejy ity.